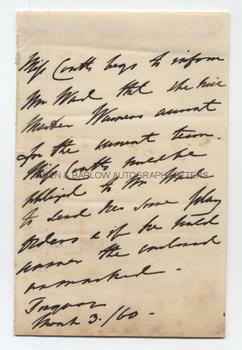 ANGELA BURDETT COUTTS autograph letter. British (English) heiress and philanthropist. AL. 1p. Torquay. March 3rd 1860. To Mr. Ward. Miss Coutts begs to inform Mr Ward that she will [sic] Master Warners account for the current term. Miss Coutts will be obliged to Mr Ward if he would send her some . . . orders and if he would answer [?] the enclosed unmarked." 16mo. Approx 5.25 x 3.5 inches. Lacking integral blank leaf and with slight mounting traces to top edge of blank verso. All else fine. In 1837 Angela Burdett Coutts became the richest woman in England when she inherited the vast fortune of her Grandfather, the banker, Thomas Coutts. She spent the majority of her wealth on a wide range of philanthropic causes, these included the founding of schools, the N.S.P.C.C., housing for the poor, lifeboats, the London Ragged Schools, support for the aboriginal Australians and the indigenous black populations of Africa, soup kitchens and the Temperance Society. She was a close friend of both the Duke of Wellington and Charles Dickens and one of her earliest projects was the establishment, with Charles Dickens of a home for women who had turned to "a life of immorality". She was particularly interested in scholarships and endowments which allowed orphans and under privileged children to obtain a good education. This letter appears to relate to such an endowment and, although we have been unable to decipher one or two words, it is apparent that Master Warner was being educated at the expense of Angela Burdett Coutts and that Mr Ward is being invited to send further detail of the term's school fees.